Liz Magic Laser’s performances and videos intervene in semi-public spaces such as bank vestibules, movie theaters and newsrooms. This free, public lecture will focus on her recent work examining the techniques of news production and the studied gestures of politicians. 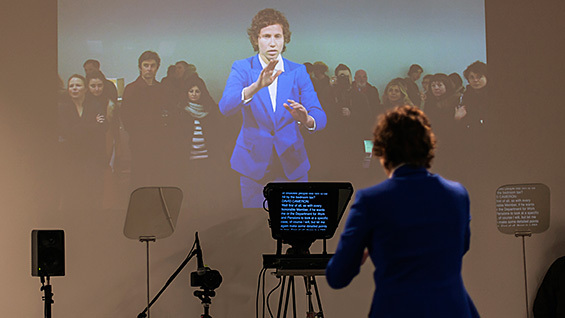 By using television news as theatrical dialogue, Laser confronts us with the mechanisms at play in the presentation and reception of current events. Liz Magic Laser appears as part of the Interdisciplinary Seminar, created as a discussion series on artistic practice for the students of the Cooper Union School of Art and the creative community that surrounds them. Lectures are free and open to the public.